NE VITAMIN C TRIO Blend is a world first. It represents unique combination of the water-soluble phyto-active compounds extracted from Kakadu Plum, Desert Lime and Finger Lime Caviar, all packed with Natural Vitamin C. With 15 powerful natural compounds, this blend will have a major impact in the extracts industry offering something exciting for hydration, de-pigmentation, collagen synthesis, whitening and brightening, wrinkle reduction, anti-aging and hair care products in a synergistic combination that will create significant advances for natural cosmetics, nutritional supplements and pharmaceuticals. 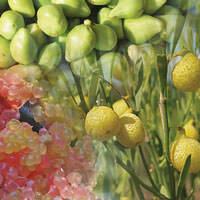 Employing BIOMIMICRY to create the first "True to Nature" full plant profile making it the first multifunctional botanical extract blend of its species.. NEW ACCESS to stable natural molecules from popular and new botanical species sees the evolution of the botanical extract – NOW we can design and tailor your natural ingredients to meet your target performance - naturally. Discover that working with the full plant profiles, as they exist in nature, draws on their combined synergistic relationships - making them more bio-available, potent and multifunctional. NEED HELP CHOOSING AN EXTRACT? ASK for our APPLICATION CATEGORY Brochures - ANTI-AGING, WHITENING/BRIGHTENING, ACNE/TEENAGE SKIN, and the latest in NATURAL HAIR ACTIVES. Call us on +61 2 6686 5725. The range of compounds is only a guide as there will be fluctuations in the range available per batch as this is a natural product and reflects the nature of natural differences from harvest to harvest, source to source. Copyright © NATIVE EXTRACTS Pty Ltd 2017. All rights reserved. DISCLAIMER: The above information is provided for general educational information purposes only and should not be relied upon or used as the sole basis for making decisions without consulting primary, more accurate, more complete or more timely sources of information. The information contained has been gathered from publicly available current and reliable source material and is intended to provide general information to readers. NATIVE EXTRACTS Pty Ltd is not responsible for any reliance readers place on the material in this document and readers rely on the information in this document at their own risk and we recommend efficacy testing to be done on the finished product formulation to determine if it meets your specific target performance. However, this information is not intended to constitute an 'authoritative statement' under the National Industrial Chemical Notification and assessment Scheme Australia and New Zealand rules and regulations. The range of compounds delivered in NATIVE EXTRACTS Pty Ltd products is only a guide as there will be fluctuations in the range available per batch as this is a natural product and reflects the nature of natural differences from harvest to harvest, source to source, batch to batch etc. NATIVE EXTRACTS Pty Ltd provides the information contained herein in good faith but makes no representation as to its comprehensiveness or accuracy. Individuals receiving this information must exercise their independent judgment in determining its appropriateness for a particular purpose. As the ordinary or otherwise use(s) of this product is outside the control of NATIVE EXTRACTS Pty Ltd, no representation or warranty, expressed or implied, is made as to the effect(s) of such use(s), (including damage or injury), or the results obtained. NATIVE EXTRACTS Pty Ltd expressly disclaims responsibility as to the ordinary or otherwise use(s). Furthermore, nothing contained herein should be considered as a recommendation by NATIVE EXTRACTS Pty Ltd as to the fitness for any use. The liability of NATIVE EXTRACTS Pty Ltd is limited to the value of the goods and does not include any consequential loss. NATIVE EXTRACTS Pty Ltd shall not be liable for any errors or delays in the content, or for any actions taken in reliance thereon. NATIVE EXTRACTS Pty Ltd shall not be responsible for any damage resulting from use of or reliance upon this information. The user of the product is solely responsible for compliance with all laws and regulations applying to the use of the products, including intellectual property rights of third parties. Ascorbic Acid, Gallic Acid, Flavone Glycosides, Ellagic Acid, Phenolic Acid : Ferulic Acid, Corumarin Derivative, ß-Carboline Alkaloid, Polyphenol Compound : Lignan, Chromene : Benzopyran, Benzopyranone Derivative : Byangelicin and Coumarin Derivative : Methoxy Auraptene, Tryptophan, Ferulic Acid, Byangelicin and Osthenone are peaks independently identified and verified by Plant Sciences Analytical Services, Southern Cross University New South Wales, Australia. SDS, Technical Specification/TDS and CofAs are available on request. Copyright © NATIVE EXTRACTS Pty Ltd 2018. All rights reserved.